Managers are powerful. The organizations of our time are in essence managerial organizations, even our societies are managerial societies. This book looks behind the portrait of management as value-free ‘technicality’ and challenges the image of managers as the selfless pursuer of an organization’s survival and development. 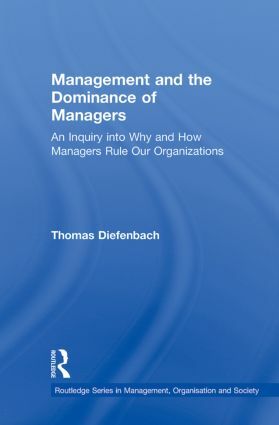 It explains that individual interests and careers of managers are only part of a wider epochal and historic picture – the picture of managers as the new ruling class using and misusing organizations for their own personal and group interests while portraying their own roles and actions as ‘increasing the efficiency of organizations’ and ‘serving the public interest’. But why exactly are managers so powerful? Why and how do managers dominate our organizations? It will be argued that the prevailing understanding of management and managers is only at the surface about functional aspects. In its very core management has been, and is, all about the power and control, interests and ideology of managers--in short, the dominance of managers over other groups of people. In order to investigate and explain this dominance, a multi-dimensional ‘theory of social dominance of managers’, will be developed which reveals the personal and group interests behind such claims and is based in its core on three explanatory factors; power, interests, and ideology. These factors themselves will be analyzed as comprehensive, multi-dimensional and interdisciplinary concepts in order to address the complex nature of managers’ dominance appropriately.